Our journey to Krakow was a bit wild. I feel like you can’t truly say you backpacked Europe without taking the train. Up until this point we had manged to fly everywhere, but the cheapest and “most convenient” way to get from Prague to Krakow was by train. Since it would take about 12 hours, we opted for the one that ran overnight. In Prague and Krakow English is widely spoken so we had a pretty easy time getting around. Sean and I were also substituting this ridiculous mash up of Russian/Czech/Polish when needed and we usually got our point across fairly easily. In the train station, however, the announcers only spoke Czech, and that combined with the distortion of the PA system we weren’t able to understand anything. What we did manage to pick out was that our train would be stopping several times as we journeyed to Krakow, and at the Polish-Czech border they would be uncoupling several cars to leave behind. So any passengers traveling farther than the boarder needed to find seats toward the front of the line. I’m fairly certain we were in the second car. We knew we were fine. But that didn’t stop us from panicking nearly all night at every stop that we would be left behind. This is what happens when you’re running on next to no sleep and traveling in Europe for the first time alone. I don’t think either of us slept for more than an hour the entire journey. We made it to Krakow with no problems, obviously. We emerged from the train station at 7:00 a.m., exhausted and hungry. The city wasn’t awake yet, so we had about an hour to wander around the park near out hotel (and try not to fall asleep standing up) with all our baggage before someone showed up for the morning shift to check us in. I remember the hotel clerk being so kind and helpful as we explained we only had 24 hours to explore this city, and she expertly drew up a game plan of the must-see attractions. Our hotel was a short walk to the main square in town. The square dates back to the 13th century, and is home to the famous St. Mary’s Basilica, an enormous Gothic-style cathedral with a stunning wood carved alter piece. We climbed to the top of one of the towers of the Basilica, just in time to see the hourly trumpet signal – the Hejnał mariacki. The performer breaks off mid-stream in honor of a trumpeter from the 13th century who was shot in the throat while sounding the alarm before a Mongol attack on the city. We’ve never been so lucky with timing. From here, we wandered over to Wawel Castle, which looks like a complete hodge-podge of every architectural style you can imagine all smashed into one. 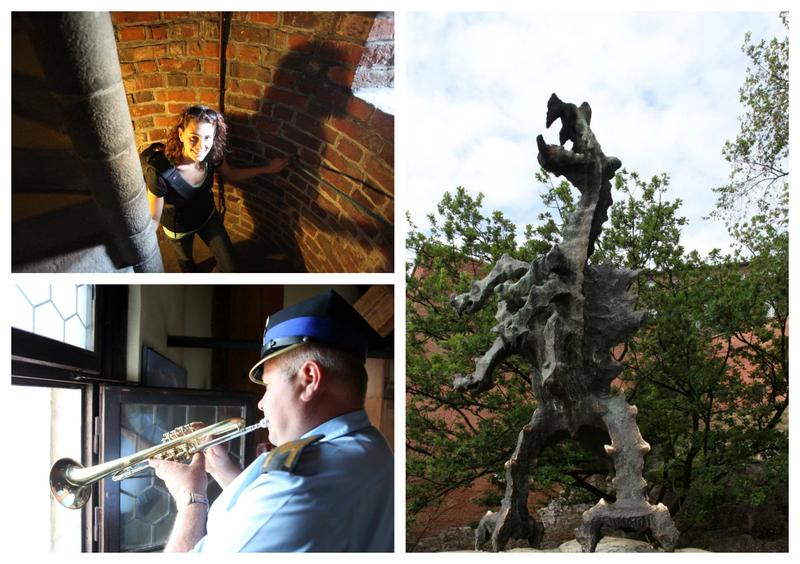 We took a brief tour which included access to the Wawel Dragon’s den. The Wawel Dragon is famous in Polish folklore, and it was said to have been defeated during the rule of Krakus when Krakow was founded and became the capital of Poland. Today a bronze statue stands as a memory of this story, and he breathes fire at five minute intervals or upon request via text message. 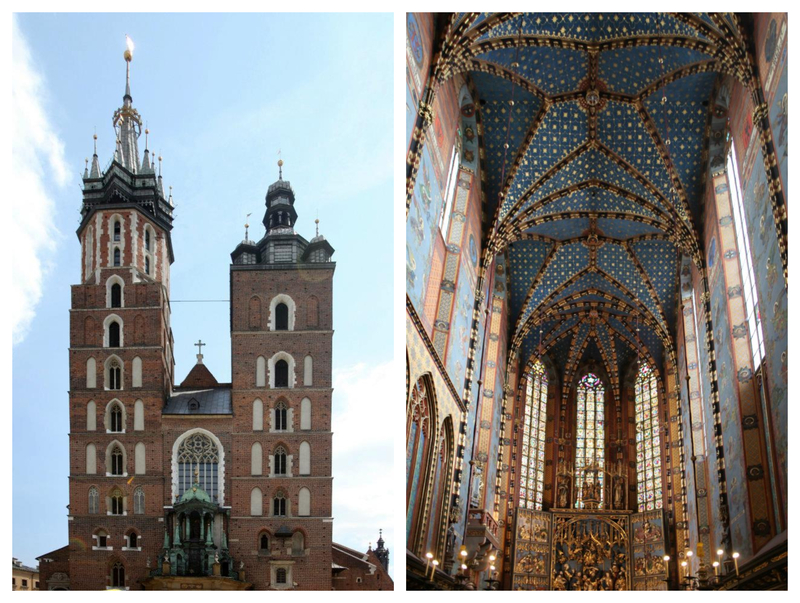 Obviously, 24 hours in Krakow is not enough. But, it was enough time for me to completely identify with my roots. I ate the food of my ancestors where they lived and worked before immigrating to American in the 1910’s. I saw the same crystal in the shops that my parents have in my childhood home. The same cuckoo clock I was mesmerized by as a child hung in every shop and restaurant we visited. And I discovered, despite my absolute hatred for most beer, I have an affinity for the Polish variety, apparently. 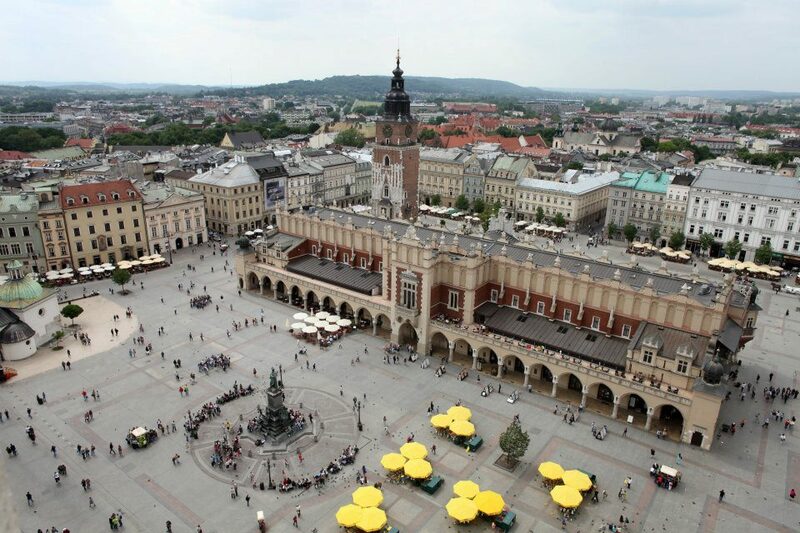 Krakow is in my blood. I hope to be back there one day soon to discover more of the city, and more of myself.